A series of astronomical tables giving the exact hours for the rising of the planets and fixed stars; compiled at Toledo at the request of Alfonso X. of Castile about the year 1252, the date given in the Latin editions being the year 1251. They are of considerable importance to the history of astronomy and even to that of geographical discovery, since it was by trusting to a revision of them by Abraham Zacuto that Columbus was enabled to reach the New World. According to Zacuto, the chief compiler of the tables was Isaac ibn Sid, a ḥazan or cantor of the city of Toledo; and astronomical observations of his, dating from the years 1263-66, were seen by Isaac Israeli. In what language the original tables were compiled is doubtful. The Latin portion refers to Jews in uncomplimentary terms; and it is therefore not likely to be the work of Ibn Sid, who is, besides, known as a translator from Arabic into Spanish of other astronomical works. 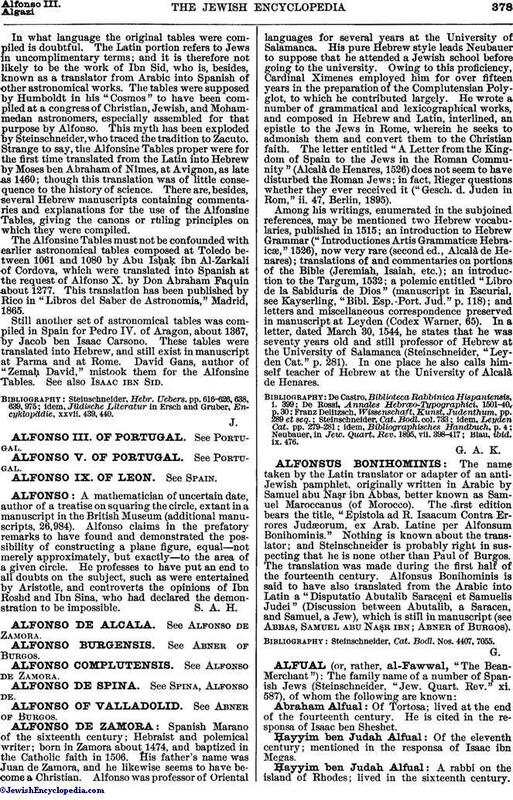 The tables were supposed by Humboldt in his "Cosmos" to have been compiled at a congress of Christian, Jewish, and Mohammedan astronomers, especially assembled for that purpose by Alfonso. This myth has been exploded by Steinschneider, who traced the tradition to Zacuto. 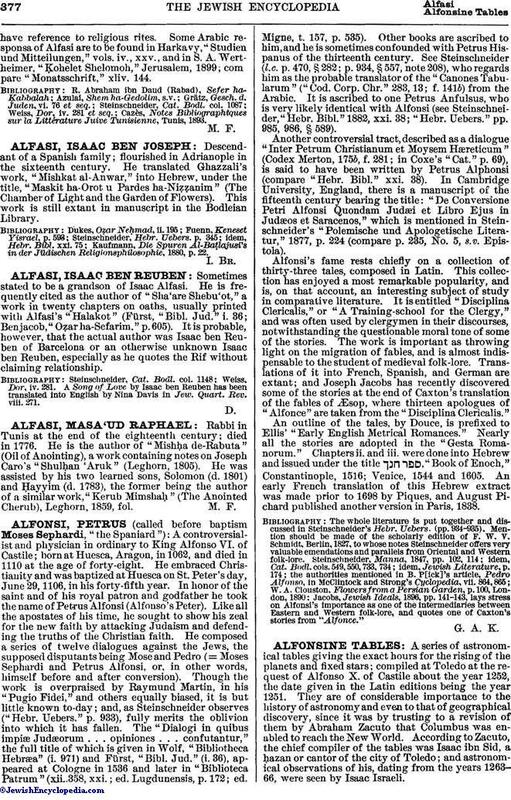 Strange to say, the Alfonsine Tables proper were for the first time translated from the Latin into Hebrew by Moses ben Abraham of Nîmes, at Avignon, as late as 1460; though this translation was of little consequence to the history of science. There are, besides, several Hebrew manuscripts containing commentaries and explanations for the use of the Alfonsine Tables, giving the canons or ruling principles on which they were compiled. The Alfonsine Tables must not be confounded with earlier astronomical tables composed at Toledo between 1061 and 1080 by Abu IsḥaḲ ibn Al-Zarkali of Cordova, which were translated into Spanish at the request of Alfonso X. by Don Abraham Faquin about 1277. This translation has been published by Rico in "Libros del Saber de Astronomia," Madrid, 1865. Still another set of astronomical tables was compiled in Spain for Pedro IV. of Aragon, about 1367, by Jacob ben Isaac Carsono. These tables were translated into Hebrew, and still exist in manuscript at Parma and at Rome. David Gans, author of "Zemaḥ David," mistook them for the Alfonsine Tables. See also Isaac ibn Sid. idem, Jüdische Literatur in Ersch and Gruber, Encyklopädie, xxvii. 439, 440.